Much against my will, I occasionally will cook meat dishes because all my children now eat meat. Used the recipe from Canadian Living. I make Pulled Pork quite often and end up with tonnes of left over Pulled Pork; there are only so many Pulled Pork Sandwiches Luke can consume! 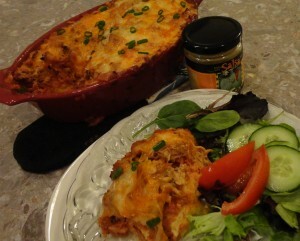 I was delighted when this recipe for Easy as Tamale Pie from Kitchen Meets Girl came through Ay Sontespli’s Kitchen ! I used to make a Tamale Pie from a recipe that I found in one of those Canadian Living Mini Cookbooks that, for a limited time, you used to be able to get when you filled up at Petro Can…I have long since lost the cookbook, to my dismay; I have tried a few times to make Tamale Pie from memory which meh, sort of worked? Anyway, I do think my problem has been solved with the discovery of this recipe. Lightly grease a 9″x9″ pan; set aside. In a large bowl combine cornmeal, flour, sugar, salt, baking powder and baking soda. In another bowl whisk together eggs, buttermilk and melted butter. Pour the liquid ingredients into the dry ingredients and stir just until combined, the batter may be lumpy. While cornbread is baking, combine tomato sauce, Epicure’s Poco Picante Mix, oregano, basil, parsley and cumin together in a small bowl or large measuring cup; set aside. In another small mixing bowl combine shredded pork with Epicure’s Poco Picante Mix; set aside. Remove cornbread from oven after 20 minutes; it won’t be quite set in the centre….that’s okay. With a fork, poke holes all over the top of the cornbread. Pour tomato sauce mixture over crust. Evenly spread shredded pork over tomato sauce topped crust. Remove foil and bake for another 5 minutes. Remove from oven, top with chopped cilantro or chopped green onions and allow to cool for 10 minutes before slicing. * if you don’t have Buttermilk on hand, pour 1 Tablespoon Lemon Juice into a measuring cup then add enough milk to measure 1 1/2 cups; let sit for 10 minutes. Alright so you made that roast beef, loads of mashed potatoes and now you have heaps of leftovers, right? 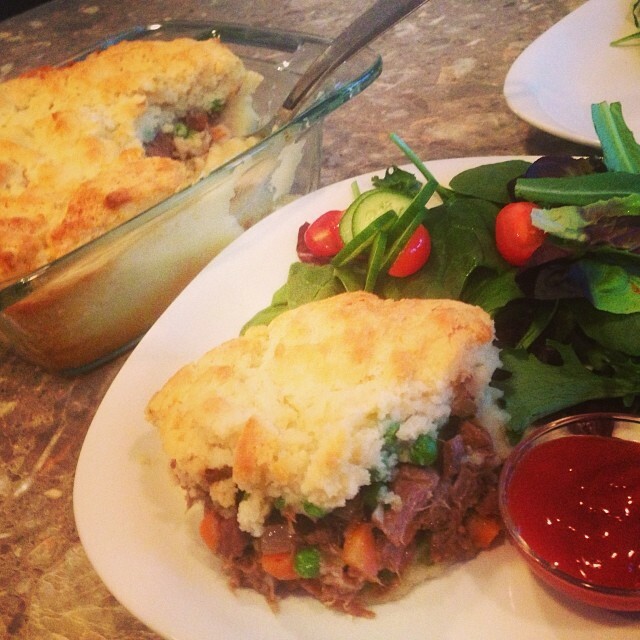 I offer you a wonderful solution:Paula Deen’s Shepherd Pie with Leftover Roast Beef found over at Food.com. I made a few changes…as I am known to do, so I have listed how I made it. My husband was thrilled that I even presented him with a lil serving of Ketchup to go with his portion. This Shepherd Pie reminded me of an Aussie Meat Pie which also begs for a good dollop of Ketchup. This Shepherd Pie is different from all the ones I have seen; it uses mashed potatoes for the “crust” and has a biscuit topping! I don’t EVER purchase Bisquick Baking Mix but a few years ago I realized that someone MUST have posted home made versions of the stuff; I was right. I make up a batch of biscuit mix now and again and keep it in the fridge for when I am feeling particularly lazy and don’t want to make ’em from scratch. I poured the goopy Biscuit dough on top of the meat filling as directed in the recipe but my son Ryan said next time I should scoop it on in mounds. I think he might be on to something with that suggestion. Lightly spray a 9x9inch square pan with vegetable oil spray. In a large skillet over med-high heat sauté onion in olive oil. Add minced garlic and continue sautéing for another couple of minutes. Add gravy and heat to boiling; cook for 1 – 2 minutes, stirring constantly. Add worcestershire sauce, salt and pepper; set aside. Layer mashed potatoes halfway up the sides of prepared baking dish. Spread beef mixture over mashed potatoes. Next, add frozen sweet peas and diced carrots. Combine biscuit topping mix with enough milk to make a goopy dough. Scoop biscuit dough and drop in mounds onto vegetable layer. Bake in preheated 350F oven for 35 – 45 minutes or until top is golden brown. I honestly don’t remember how I came across this recipe? What could I possibly have been googling? Well, I had pork chops in the fridge, that I know for sure. But cranberries? It must have been a fluke that I had some tucked away in the freezer? It went over well with the meat eaters and it smelled pretty good while it was cooking. 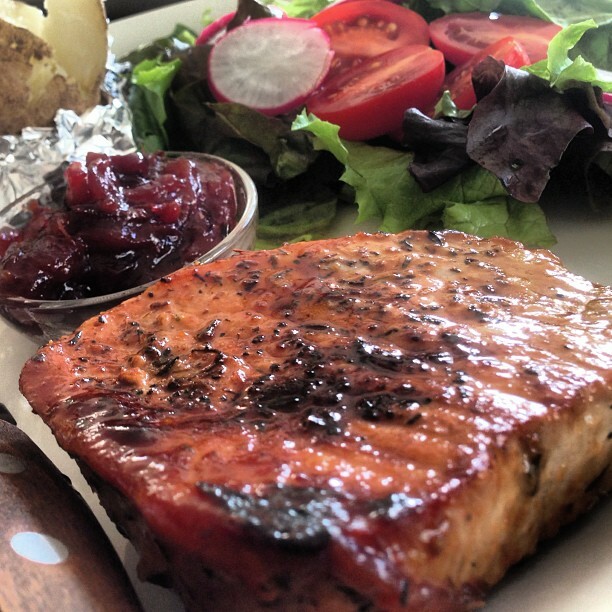 At any rate, I found this recipe for Pork Chop Saute with Cranberries over at Eating Well. Head over there for a peek at all their great recipes! Easy enough to pull together for a meal on a busy week night. Mix thyme and 1/8 teaspoon each salt and pepper in a small bowl. Sprinkle both sides of the pork chops with thyme mixture. Stir until well blended the cranberry juice and honey in a 1-cup Pyrex measuring cup. Heat oil in a large nonstick skillet over medium-high heat until hot but not smoking. 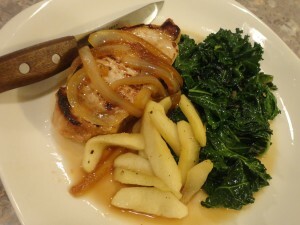 Add the pork chops and cook until browned on both sides, 2 – 3 minutes on each side. Push the chops to one side of the pan, add onion to the empty half of the pan and cook, stirring, until the onion is soft and beginning to brown, about 1 – 2 minutes. Pour half the juice mixture into the pan. Reduce heat to medium and cook, turning the chops occasionally, until cooked through 2 – 4 minutes. Transfer the chops to a serving plate and tent with foil to keep warm. Add the remaining juice mixture to the pan. Increase heat to high and cook until the mixture reduces to form a syrupy sauce, about 2 minutes. Spoon sauce over the chops. 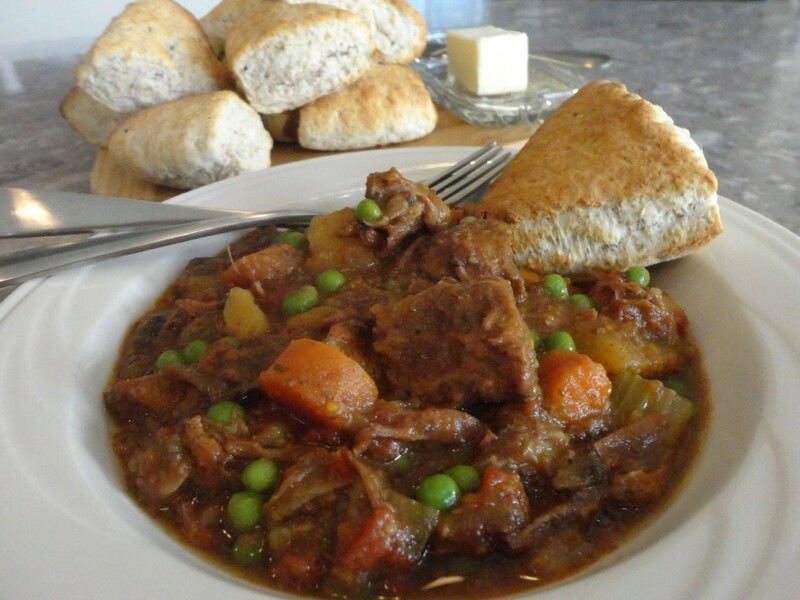 With cooler temperatures prevailing it’s time to haul out the slow cooker for some comforting stews; and don’t forget to make yummy bread to go with it: Dinner Rolls,Biscuits, Dumplings or pick up some Multigrain Rolls from the grocery store on the way home from work. For ease of cleaning I like to spray the inside of the crock pot with vegetable oil spray. In 4.5-6litre Slow Cooker mix together beef, potatoes, carrots, celery, onions, garlic, beef stock, tomato paste, bay leaf and Worcestershire sauce. Cover and cook on LOW for 10 – 12 hours (or on HIGH for 5 to 6 hours) or until beef and vegetables are tender. 30 – 60 minutes before serving, add frozen peas, salt and pepper. Whisk corn starch with a bit of water to make a paste; stir into stew. Cover and cook for another 10 – 15 minutes.